Durbanville is well known for its wine valley, but it is quickly becoming just as renowned for being a mountain biking mecca with a huge variety of trails to choose from, and the country’s largest mountain bike club. Established in the mid 90’s, the club has grown to become the largest in the country, with more than 6000 members. With a goal of establishing 120+km of MTB trails in the Durbanville Hills, the club also aims at increasing participation in the sport. Mission accomplished then with the club membership ranks booming and trail builder Patrick Roberts and his team having cut trail throughout the valley. Day passes are available for certain tracks, at varying costs, while a full membership will get you access to member only trails. 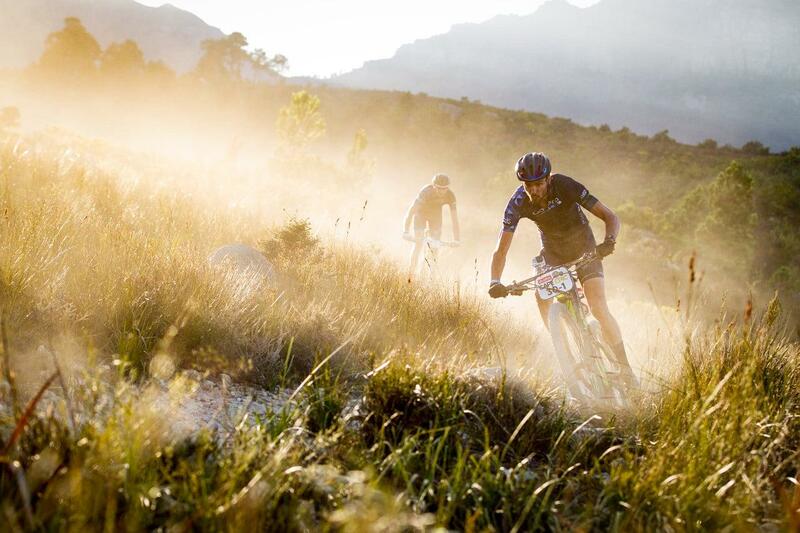 Image courtesy of Absa Cape Epic. The official home of the TMTBC, riders are spoilt for choice at Bloemendal. Divided into Lower Bloemendal – geared more for the younger and novice riders – and Upper Bloemendal – for more advanced riders – the tracks here offer something for everyone. Permits to ride cost R50 and this is strictly enforced. A medium-length trail, comprised of two concentric rings, the lower green route and the higher red route, both 7km long with 250m of climbing. The climb can be challenging but riders are rewarded with epic views of Robben Island. Privately owned and run by Contermanskloof Farm, this trail is a tough 15km ride and will give you a hard time out if you’re just starting out, but novices and beginners can give it a go with easier routes around obstacles if necessary. This 8.5km trail cut through the Hoogekraal farm offers a gentle warm-up on jeep track before providing a bit more of a test with some sweeping singletrack, ‘Beware Alley’, and a 4km climb with some tricky bends and switchbacks. The Green Corridors link one riding area to another and these routes are only available to members of the Tyger Valley Mountain Bike club. For more information on these routes and how to gain access, visit the club website. Host to the prologue of the Absa Cape Epic, the trail is maintained by the farm. The route is made up of three inter-leading trails of 5km, 12km and 18km. It should take 1-2 hours to get through depending on your pace. Perfect for a ride after work, the Majik Forest trail is located just a few minutes away from the Tyger Valley Shopping Centre. The trail has some tough climbs and plenty of everything else in between, from rocky sections to drop-offs and some great forest trails.